While Disney and many heavy hitters shut down anyone trying to remix their creations, it’s awfully refreshing to see George Lucas and his army of lawyers turn a blind eye to the Star Wars mash-ups that appear on what seems to be a daily basis. 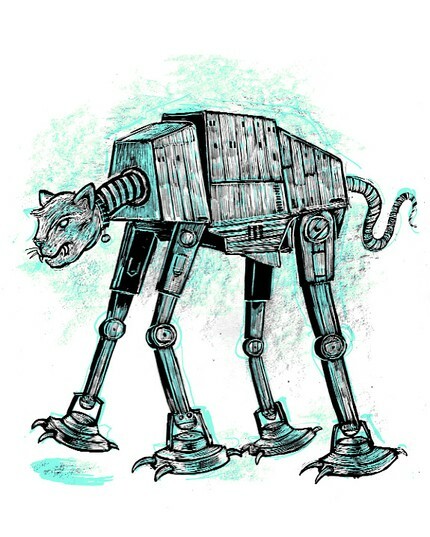 Dan Grzeca’s Cat-At is beautiful and awesome and reminded me of how much I really wanted the AT-AT toy when I was a kid and needed to be shared. You can purchase it for $20 from his Etsy store. September 10, 2010 in Inspiration, Media Evolution, Teh Hotness. ← TIGJam 3 is a go!